HTC FootballFeed comes to Android phones. HTC is the Official Global Smartphone Supplier Partner of the UEFA Champions League and the UEFA Europa League. That's why they're offering you an early release (BETA) version of the app - available for free from 26th November in the Google Play Store. The HTC FootballFeed app for Android phones was designed to bring you closer to the game with a combination of news, up-to-the-minute UEFA-powered stats, insights, and exclusive content from every match, club, and football player in the UEFA Champions League and UEFA Europa League. 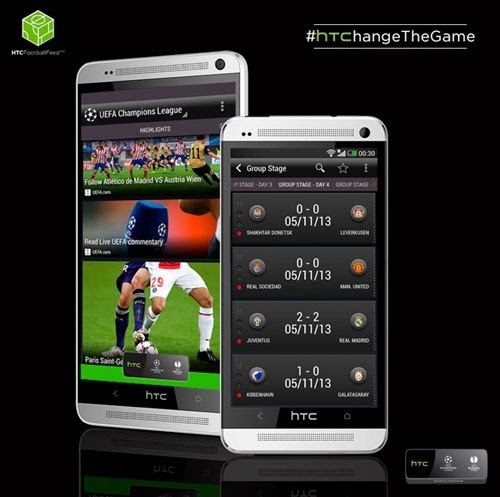 The HTC FootballFeed app is the perfect match-day companion. It comes with an easy-to-use design, based on the innovative BlinkFeed user interface. This ensures that all the information displayed in the HTC FootballFeed app is 100% customisable, so you only get the news on the teams that matter to you.